Mountain Bike Amputee does not charge or collect membership fees and does not manufacture or sell products or services. PLEASE NOTE: Mountain biking and cycling have inherent risks. Always wear appropriate protective gear and ride within your comfort zone and ability. This Page was included to allow non amputee cyclists and mountain bikers suffering from various disabilities or injuries to share their information and experiences. 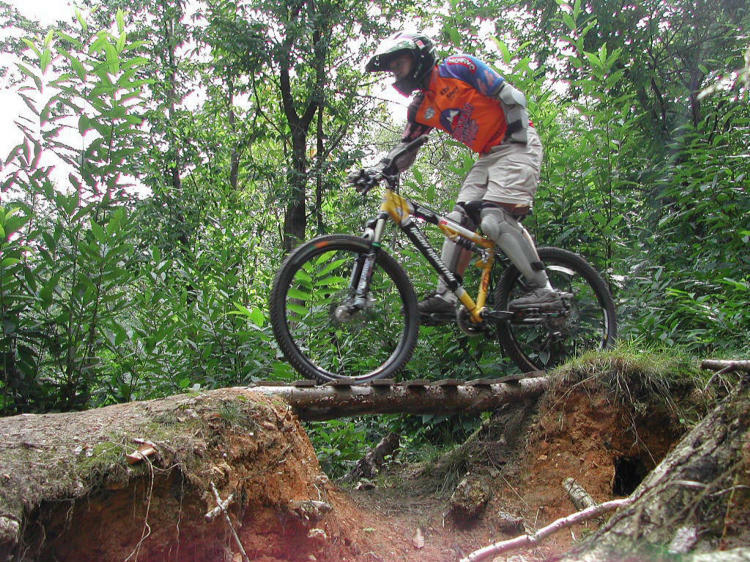 This page is also intended to allow able bodied mountain bikers and cyclists to share their knowledge on equipment and riding skills and technique. I would like to offer the following tips to anyone suffering from a weak or diminished grip, and that is, to use hydraulic disc brakes and Shimano Rapid Fire shifters. Hydraulic brakes offer one finger stopping power while the Shimano Rapid Fire shifters are the most ergonomic friendly and easy to operate. The following contribution was made by Randy Hanson. 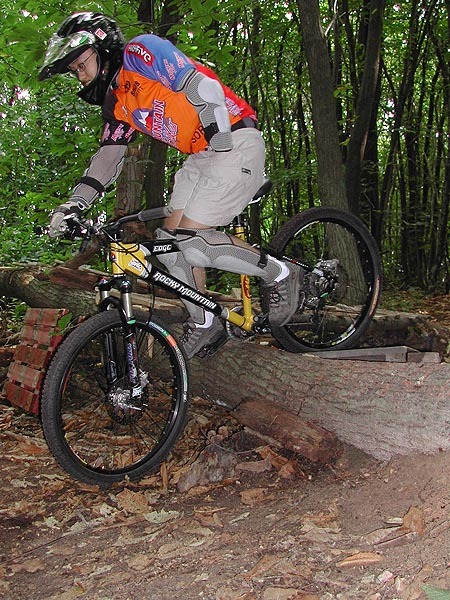 Randy is an avid cyclist both on and off road who suffers from chronic tendonitis. He has some great advice for anyone suffering from a weak or diminished grip. I have chronic tendonitis in my wrists. Before I got Hayes disc brakes I had to stop on any significant downhill to let my forearms un-cramp. A small change like that can make a big difference to riders with physical limitations. I also had a similar problem on down-hills on my road bike -- I replaced the handlebars with the anatomical handlebars which eliminates the bend in my wrists while on the drops and replaced the Shimano RSX brakes with the Shimano Ultegra brakes which have a metal backing to the brake pad and much superior braking performance. These changes have really helped on my road bike. I would still like to get discs for my road bike, I think it can be done but I haven't really investigated it. The following contribution was made by Doug Owen who is an USAC certified coach. I have joined the growing group of cyclist with a prosthetic. I am among of the fortunate ones in that mine is limited to a fully functional cobalt, titanium and plastic knee. I had my total knee replacement done in November 2009. I have found that I can once again ride and have found that I now have a new avenue to reach out and help others who are adjusting to artificial parts on their body. Over the past 10 years I have been featured many times in the Arthritis Foundation publications. I look forward to making contact with others and hopefully help people to understand that "obstacles are really opportunities." The following comments were taken from an email from Michael Maier, who lost the feeling in his left leg after breaking his back. Michael was able to recover most of the function of his leg with the exception of his calf muscle, attributing cycling as a major part of his recovery. I broke my back some years ago and lost the feeling in my left leg, completely pelagic. Over the years I have been able to restore much with bike being a major part of that. One problem I had was my calf muscle is still completely pelagic. I don't have any hope for it coming back, its been 10 years. I can ride ok but my foot collapses onto my ankle it causes severe pain in my ankle. So I built a brace. (see picture) I have done some variations since this picture was taken. Since I don't use my knee brace anymore I cut it into two and replaced that white shin guard with the lower halve of my knee brace. That looks better and seems to work ok but would like help building this better and lighter. The idea works great. I can stand up and pedal now and going down hill dose not hurt so bad. There are quite a few people with this problem . I broke my back but many other people lose control in there legs because of diabetes or car accidents. Bad circulation happens and can lead to loss of feeling. For upcoming events go to News And Events. Recovering from my broken back I had all kind of braces. After seeing how many times it took the "professionals" to fit me with my knee and back brace I thought I would take a whack at my own foot brace. I took a digital picture of my foot while pedaling my bike. I then imported that picture into AutoCAD and measured the angle and distances. The shoe has a stainless steel shank and the brace bolts to that. It keeps my ankle from collapsing while riding. For the first time I could stand up and pedal up a hill. Dan Mead along with fellow Prosthetist Bill Buston, have come up with a hinged crank arm that allows leg amputees and those suffering from limited range of movement in their knee to pedal. For more information visit The Hinged Crank Arm. 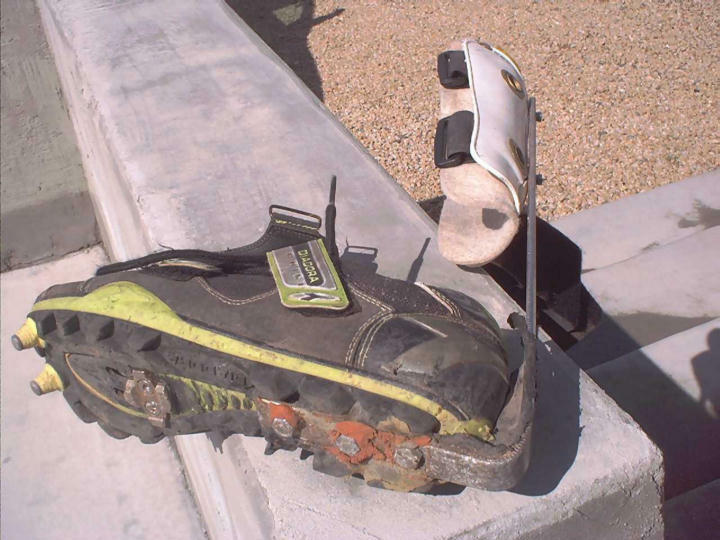 The following pictures were taken and submitted by Dax Jaikel (who is featured on the Leg Amputees page) at the 2003 La Ruta de Los Conquistadores endurance race. The pictures are of Carlos Valerio from Costa Rica. Carlos had his right arm seriously injured after being hit by a car while training for a triathlon. I'm impressed! Very impressed! What you do to be able to ride a mountain bike is unbelievable! But why do you use two shifters? Maybe you have already heard of Rohloff hubs. These hubs have 14 gears witch covers the same range as 3 x 9speed. The big advantage is that you have one grip shifter for all 14 gears. Maybe it helps to give you an even better bike experience. The following contribution was made by Ricardo Rueda. PS: I think the website is not very clear telling how does it work, but the upper part of the fork swings a little bit and that’s how traction gets to the front wheel. If this is of any interest to you, p lease email Gary Tingley at gary@rotorcranksusa.com or visit Gary ’s website at www.rotorcranksusa.com, or call Gary at (619) 335-0180. Below is an email that I received from Joe Sapere who is the head of Amputees Across America, a group dedicated to getting amputees out and active, similar to your organization. Every year they ride bikes across America visiting hospitals and sky diving in various spots along the way. A fun group! "Your product is an answer to my prayers. Amputees cannot stand up on the pedals because they do not have the toe flexion to get the pedal past the TDC of the rotation. 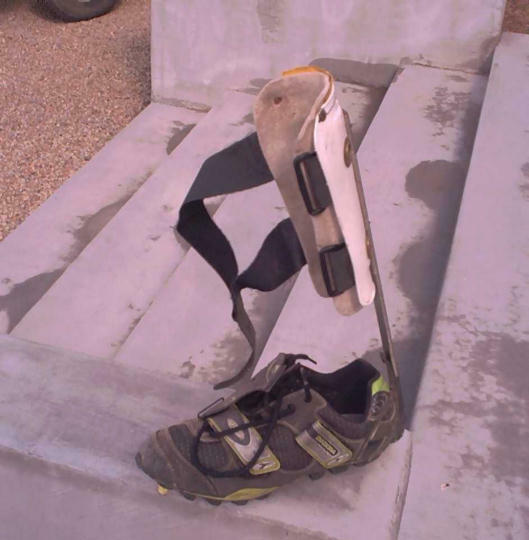 Your product would overcome this and be a boon to the amputee rider." Reply after trying the Rotors for the first time"
"I know I was to ride a week or so and THEN call you with what I think of the Rotor Cranks, but I would rather not wait till then. I had it put on and picked up the bike from the shop yesterday. From the start, it felt just like a normal pedal stoke. It felt the same as always so I was wondering if maybe the cranks were not working. Then I stood up on the pedals. Oh yes, it was working. For the first time since my amputation in 2000, I was able to stand on the pedals and pedal. Unbelievable! I couldn't wait to find a hill to do a standing climb. Well, I did and the rest was history. Things are working so well, I don't even want to try any other regulation point than 3 because it just can't be any better than this. As I could barely contain my exuberance, I have put it on the first page of my website. You may check it at www.amputeesacrossamerica.com. As you may notice, I did not provide a link to your website because I want all the amputees who read it to hear my story (and maybe even mention my name when they order theirs). Now I will just have to figure out how I can equip the recumbent I am ordering next month and the bikes of the three riders each year. To say I am pleased would be an understatement. I called the guys from last year's ride and they probably think I have gone bonkers. They will sing a different tune when I pass them on a hill and when I stand to sprint." I came across this damping devise called the Hopey Damper, a device that gives more control to the handlebars. I’ve never used the device but it has excellent reviews on MTBR, and I reckon that for one handed riders it would be a huge benefit. From what I understand the device stiffens up steering and holds the bike straight easier. When you do steer it’s easy enough, but just makes it more controlled. It basically takes out all of the steering chatter. From the site: With the hopey bicycle steering damper, Downhill racers experience enhanced stability, improved cornering, and a far less fatiguing ride. This is because the steering damper absorbs the hits that throw the bike off line. XC riders and Roadies share the same benefits, plus, find that the damper helps with climbing. Technical climbs are easier, you hold your line and won't need to step off as often. Power climbs are more efficient, since more or your energy input is directed straight forward. The damper is not cheap but I thought it might be worth it to get Tim Hopeys' (the inventors) thoughts on using it for on handed riding. If it as beneficial as I’m thinking a lot of your readers might be interested, and who knows? Perhaps they might even provide a discount for your readers too. Yes, the hopey offers a huge benefit for the disabled rider. A bike is designed to stand up and go straight when it is moving. That is what the rake and trail of the front end is doing for you. That is why “once you learn to ride a bike you’ll never forget” because subconsciously you figured out how to let the bike do the work. Your hands are on the handlebars to mostly keep the bike controlled and straight. Most corners are executed by leaning the bike, not turning the bars as much as you think. Your bike wants to go straight, you want it to go straight. The hopey assists in keeping the bars straight. In rough terrain, there are all sorts of things knocking you off line, the hopey is doing the work for you, keeping you on line. We have sold a lot of hopeys to amputees and the injured. All are very satisfied. I remember a disabled Olympic guy using one, couldn’t ride without, road bikes I think. Stay tuned for future updates and additions.